I recently completed an E-Design for a client who built a new home in the country. Let me start by saying that after looking at the gorgeous photos and specs of this home, it was definitely a project I wanted to take on. Patty contacted me a short time after she and her family moved in. She found that some of the furniture wasn’t working in the new space and the room lacked cohesion and that wow factor. We decided to start on the sunroom design first, since it seemed to be the biggest challenge and was a room the family wanted to spend a lot of time in. After seeing the sunroom design, I’ve been given the green light to move on to the next area of the house- the bonus room. This space is where Patty’s teenage daughter and her friends hang out. I think it’s going to be a fun design! Update: Check out how the bonus room design turned out. Note: Client’s details (such as budget breakdown, profile, etc.) have been excluded for confidentiality reasons. This plan is a snapshot of one of our E-Design Kits and does not showcase all components in order to respect the fees associated with our services. 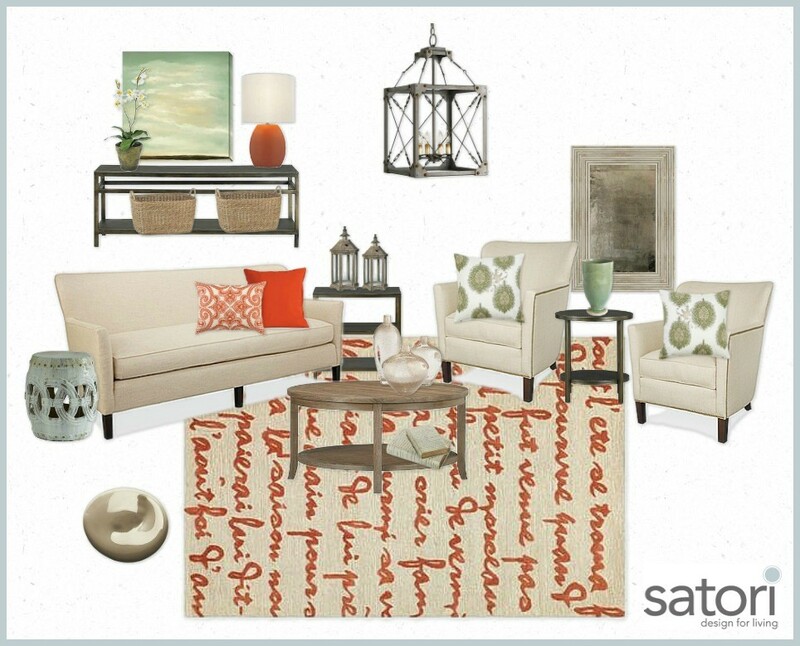 All designs and images are property of Satori Design for Living. Please see General Policies if you have any questions. Beautiful plan, Shauna! Can’t wait to follow along on this one! Thank you so much! Starting the bonus room this week. The plans look amazing! I am loving the red writing on the rug and the follow through of red accents throughout! It is perfect! Can’ t wait to see the rest of the room! Thank you. Somehow I knew you’d like that burnt orange color. oh my gosh Shauna it looks amazing!! And Im not surprised that she wanted you to work on other rooms in her home!! You are so sweet! I love all the boards you put together and your feedback is greatly appreciated! Nice job! Looks so inviting! Thank you! I still love the board you put together for the front entrance. I may steal a few of those ideas for my own! Thank you for your kind words! It was really fun to work on. I wish I had that room, as it is set in the country with a tonne of windows all around.